Our token curated registry is off to a flying start. To incentivize even more submissions, we're giving away 1 Million PNK to token submitters. Read on to find out how you can get your own PNK! The token curated registry requires tokens, that's a given. So far, we've seen a healthy amount of submissions from the community and various projects. Now, we're offering an incentive for further submissions from the community. You will receive PNK in accordance with the amount of valid tokens submitted to the list until 30 June at 23:59 UTC. For example, if you make 10 valid submissions from a total of 500 valid submissions, you would receive 20k PNK. What Constitutes a Valid Submission? A token must be accepted to the list (pending challenges and juror decision if necessary). Here we can see a registered token in the form of DAOstack. Notice the blue registered tick to the right of the token name. Once a token has been successfully registered on the list, it will look much like the one above. Only tokens which are in this state at the end of the three month period will be eligible for the PNK payout. How Do I Submit a Token? Follow the instructions in the image below to submit a token to the list. First click on the 'Submit Token' button in the top right hand corner to be greeted with a pop up window as shown below. Fill in the required info as stated above. 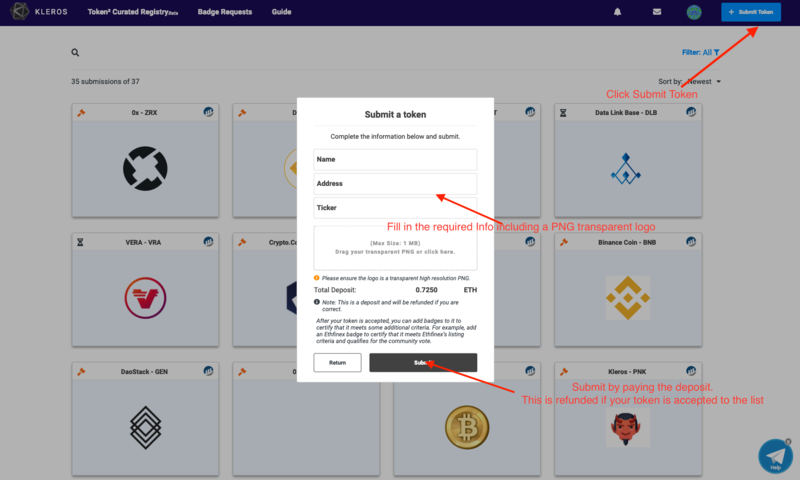 Double check the logo is a transparent PNG and hit 'submit' paying the token listing deposit. Upon submission, your listing should look something like the token below. The submission is not yet accepted to the Token Curated List. Upon clicking on your submission you will see the info displayed below including the challenge period. This is the time allotted for other users to challenge the listing in the case of incorrect data or logo format. Click on your submission to see the current status. Once this challenge deadline has passed, the token status will change to 'Registered' as shown below. Remember, users can also challenge the submission, which will then send it to trial to be arbitrated on by Kleros jurors. They will make the final decision based on any evidence given if the token should be listed or not. A registered token on the TCR. This means it's now possible to request an Ethfinex badge. Once a token is successfully listed, the status will change to 'Registered' as seen above. These tokens may still be challenged and sent to trial, but assuming the status is 'Registered' at the end of the incentive period (30 June at 23:59 UTC), the token will be eligible for the PNK payout. and go straight to the list by clicking below. Decentralizing Exchange Listings: What Have We Learned So Far?